One of the hardest things for me is to find gifts for all my neighbors. I was looking for something to make in my slow cooker and I came across these Crock Pot Nut Clusters! I remember my mom used to make them all the time when we were little and I was so excited to give these a try! I couldn’t believe how simple they were! I will be making these again for the rest of the neighbors! 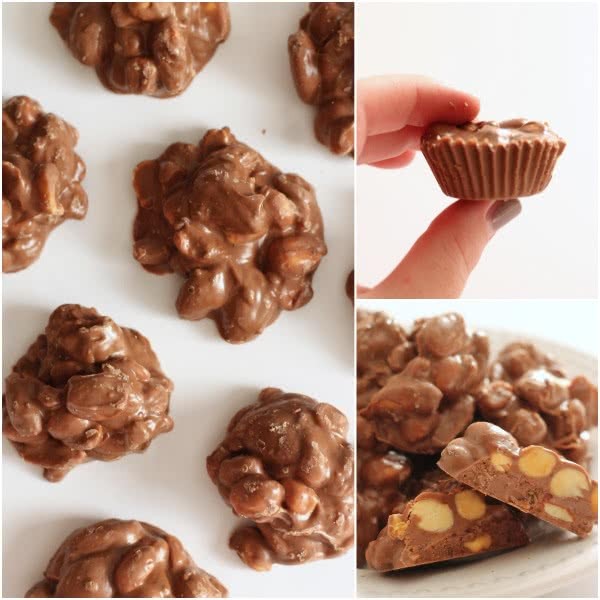 These easy crock pot nut clusters make the best holiday treat (and it makes SO many of them!). Turn slow cooker on high and add all the ingredients. Cook for 45 minutes (don't peek or stir). Spoon mixture into miniature muffin liners, or onto wax paper-lined cookie sheet. Store in an airtight container or place on trays for holiday gifts. These would also be really tasty with raisins added in, too! We've been doing these for years. We don't use the muffin liners, but just dump little spoonfuls on wax paper. No raisins, though--we're not dried fruit lovers around here. Is there anyway I can pin this for my pinterest? http://pinterest.com/about/goodies/ - "Pin It" button works for me. Could you make a smaller batch of this? Thank you! I'll be making these for our family cookie/candy exchange this year. I love your blog by the way!!!!! I've found some great recipes that our now made all of the time. I like nut clusters very much!! Wow, this makes a lot. Perfect for gifts for the neighborhood. Pinning! Oh yea I am trying this!!! That looks AMAZING!!! I wonder how it would taste to add some crushed peppermint in there, too??? These look so good and would be a great treat to make for the holidays! These sound so good and simple! Perfect for Christmas. Oh my, that's a lot of chocolate! Not a fan of raisins, so I would just make it like you show. Might need a double batch, though, we love nuts and chocolate around here! Can you tell me what size Hershey Bars you used? The Hershey bars are 1.55 ounces each.